If you generate any amount of medical waste, you are responsible for the proper disposal of it. Anything that has been contaminated with hazardous medical waste or other potentially infectious materials (OPIMs) must be sealed and packaged before it is tossed in order to protect employees and the environment. 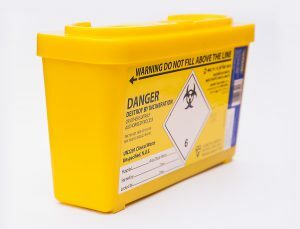 Laws have been established by the Department of Transportation (DOT) and the Occupational Safety and Health Administration (OSHA) that require certain storage and disposal techniques and specific containers for potentially harmful wastes. Knowing how to legally and safely store and dispose of your medical waste can be confusing—using a professional service provider can make it a lot easier. This article will help get you on the right path as far as how to contain your medical waste while it’s in your possession, and how to package it for disposal. Medical waste cannot be mixed in with normal trash, so organizations that produce medical waste should have clearly labeled, secure bins or containers where employees can place medical waste. Once the waste bins are full and ready to be thrown out, there are rules governing containment for transport and disposal. The Department of Transportation has laws that apply nationally, but many medical waste disposal laws are enforced at the state level, so always be sure to check in with local policies before you act. The Department of Transportation (DOT) has created strict laws concerning the containers in which medical waste is stored during transport for disposal. Always make sure you label the contents of containers. For instance, if it is biohazardous waste, mark the container with the biohazard symbol. Depending on how much waste you have to dispose of, the way you contain your medical waste differs. If you have a small amount or one type of regulated medical waste, you can follow the DOT guidelines for non-bulk packaging. Under these rules, solid regulated medical waste can be placed in red liner bags as long as they are closable and leak-proof. 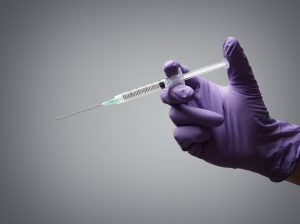 Liquids and sharps should be placed in thick liner bags, and then placed inside rigid, puncture-resistant and leak-resistant DOT approved containers. Bulk packaging refers to large packages containing distinct, smaller packages of medical waste. The large packaging itself must be puncture-resistant and made of either metal or non-porous, rigid plastic, and be constructed, tested, and marked in accordance with United Nations packaging requirements. A plastic film bag (a red bag) is sufficient as the inner packaging for solid medical waste, and it can hold liquid waste as long as there are also sufficient absorbent materials contained within the bag. The bag must be marked and certified as tear resistant at up to 480 grams of pressure, and must be sealed properly (must be able to be inverted for five minutes without leaking). They cannot weigh more than 22 lbs. The inner packaging for liquid waste must be a rigid packaging conforming to UN standards that is puncture-resistant and leak proof. Inner packages containing liquid cannot weight more than five pounds each. Sharps inner packages must be rigid, puncture resistant, and completely sealable. These inner packages can be reused if they are approved and permanently marked for reuse, disinfected between each use, and have a capacity between two and forty gallons. You can purchase medical waste disposal containers from medical supply companies, some pharmacies and health care providers, or online. However, if you use a service provider, they will provide the proper containers for you, and dispose of everything correctly either through a mailback system or by container pickup. With mailback services your provider will send you everything you need, including an acceptable container for your waste, a shipping container, a prepaid shipping label, and instructions for the entire process. This type of service is great for smaller quantities of medical waste. With container pickup services you are given a collection container to meet your capacity needs, and your service provider will stop by when it’s full to collect your medical waste and take care of the rest. If you regularly accumulate medical waste, this type of service is optimal. When you use a service provider, you don’t need to worry about your containers at all—they take care of all the dirty work. Not Sure Which Container to Use? Call Medical Waste Pros Today! Medical Waste Pros understands the importance of the proper storage and disposal of medical waste. We have professionals who have been in the industry for years, are fully aware of all federal and state laws, and know medical waste disposal best practices by industry. Call us today at (888) 755-6370 or fill out the form on the right to receive free quotes on medical waste disposal services near you. We will make sure your medical waste is disposed of properly, so you can focus on what you do best.